Harry Laplatte made his final show of the 2011 season, the annual Daytona Turkey Run, a good one speaking and mingling with tons of street rodders peppered with many former drag racers all interested in the ongoing happenings of the crew at DragRaceHallOfFame.com, this past weekend. The event is held at Daytona International Speedway each November. 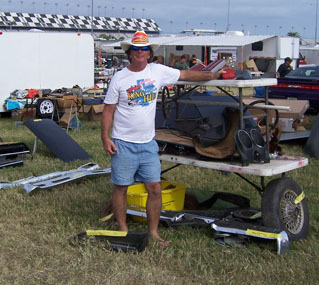 Here is Harry looking "Kool" in the swap meet area, where he sold plenty of good old parts! 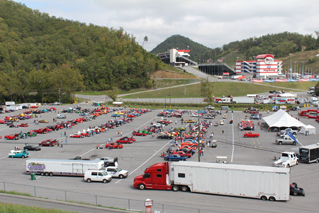 September 23-24-25 - The Super Chevy Show made its rounds and once again landed at the beautiful Bristol Dragway in Tennessee. 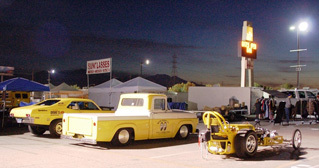 The entire event saw growth with the car show, swap meet area and drag race portion all rockin' throughout the weekend. 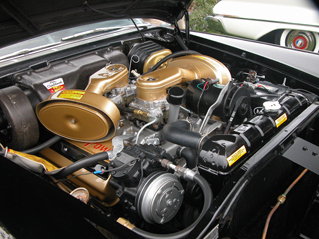 Many of the attendees commented how much the show improved since last year (2010) and that they planned to finish work on the Chevrolet in time for the 2012 Super Chevy Show! 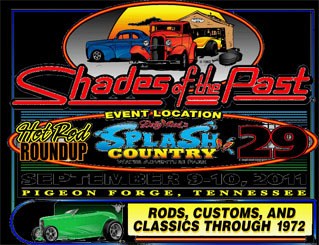 Pigeon Forge, TN - Another traditional hot rod and custom show having run successfully for the past twenty-four season in Tennessee! 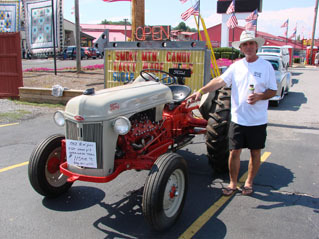 The show features a wide variety of cars and some tractors as well. Harry said the show was full of lots of cool cars and plenty of nice people to chat about old cars and drag racing from the past a show worth attending! Very nice 1964 Ford Fairlane powered by a 427 FE. Radnor Hunt Concours d"Elegence - Although this show does not showcase Drag Racing cars per se, the show deserves mention as it does provide to the history and heritage of automobiles and motorcycles, plus all proceeds go to the Joan Karnell Cancer Center at Pennsylvania Hospital in Philadelphia and Thorncroft Equestrian Center in Malvern, PA.
Each year, the event features a different marque with the 2011 highlighting Chrysler products of the mid-1950. 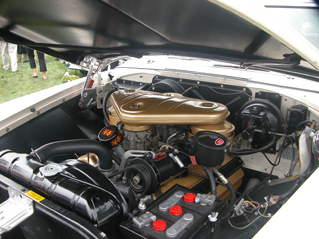 There were a wide range of Chrysler products from Dodge, Plymouth Chrysler and Desoto. 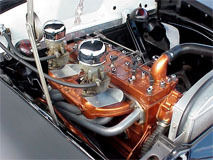 The main connection to drag racing is definitely the great engines of the era in their Chrysler 300 series with the advent of the dual quad Hemi up to the wild cross-wedge 413 engines. A very strong spectrum of other vehicles and vintage Ducati motorcycles were on display as well. The “Best of Show” award went to a 1937 Talbo-Lago, a car worth approximately $4M! (photo page). As a backdrop to the great assortment of vehicles there were riders doing jumps and horse driven carriages in the adjacent fields. August 19-21 - This was the first time Harry attended an event at Bandimere Speedway and first time being in Colorado. In his words, all he could say was totally awesome! The reception from John Bandimere Jr. and his staff was terrific. From the time he landed at the airport everyone welcomed him with open arms and to date was by far the most gracious group of people he has met as part of the Super Chevy Show 2011 tour. The facility and the views are/were spectacular with the track being built into the side of a mountain by the late John Bandimere, Sr. in the 1960's. As a side note John, Sr., the founder of the facility, raced a 1964 Plymouth Hemi up Pikes Peak, which goes to show how long the Bandimere family has been into Chrysler products. Mopar is also the longtime sponsor of their Mopar NHRA Nationals each July. The Bandimere Speedway SCS was great with several hundred race and show cars and thousands of spectators in attendance, plus a fairly large swap meet, which is Harry’s expertise. 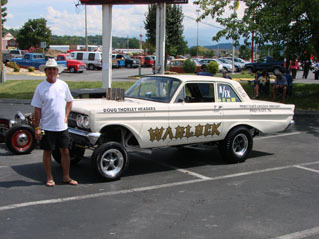 The quality of the cars was second to none and he looks forward to returning for the Super Chevy Show again in 2012. 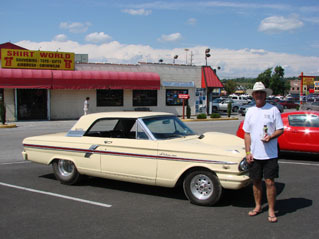 The 3rd annual Pocono Drag Lodge Reunion, formerly located in Bear Creek, Pennsylvania was a treat for Harry as he was able to locate a fair amount of early “Drag World” newspapers with several articles covering his Dad’s “Satellite” 1964 Plymouth Hemi. The event was strictly a display of old drag cars and variety of nostalgia hardware and the drag strip is in ill repair having been abandoned for many years. We met a lot of old-timers and had a wonderful time chatting about drag racing and the great cars that were available off the showroom floor back in "day." As can be seen in the photo above, a fair amount of people supported the event. July 2011 - Harry, better known as "Harry the hat", continued his trek attending several events on the east coast over the past few weeks. The first stop brought him to the Darwin Doll's 10th annual York US 30 Reunion held at the York Fairgrounds on Friday, July 8th, where he met up with George Case. The duo met and chatted with many of the stars of Drag Racing, plus viewed countless beautifully restored 60's era drag machines. The highlight of the show for Harry was meeting Ms. Hurst Golden Shifter, Linda Vaughn! 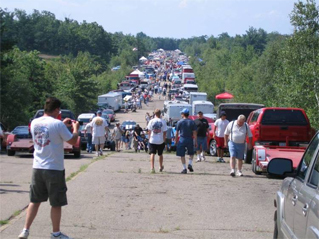 On Sunday, July 10th, the racers moved up to Beaver Springs Dragway for the continuation of the show at the Nostalgia Nationals. Track owner, Bob McCardle (aka "the Beaver") puts on a great event catering to all in attendance! A big surprise to Case was being named one of the "Legends" of Drag Racing! The following weekend, Harry continued on to Maple Grove Raceway as part of the Super Chevy Show, where he assists in the managing and layout of the flea market/swap meet area at all of the SCS shows. The Maple Grove Raceway event had great turnout of participants and cars at the fabled racetrack. 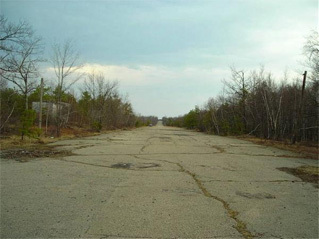 Old Bridge Township Raceway Park, in New Jersey, was the next stop on the list attending the 10th Annual Funny Car Reunion. 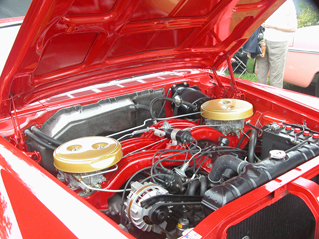 The show featured many great historic race cars, a car show, music and nostalgia drag racing. In attendance was the 422 Allstars, the nostalgia drag racing club based out of Oaks, PA. John Warehime, the 2009 Allstars Champion, claimed the class win defeating Tony Silipena for the title and moving him into the number one spot in the point's chase. Next stop for Harry is the upcoming Super Chevy Show in Denver, CO at Bandimere Speedway August 19-21. After Bandimere Harry's next stop is Lead East in Parsippany NJ starting Wednesday, Aug. 31 thru Sunday, Sept. 4, 2011 at the Hilton Hotel. NHRA Fuel Car Testing was A+, fans were able to meet the drivers and first time appearance for the Force Team. The Night the Lights Went Out in Georgia A+, first time I've been to a drag radial meet. My favorite was the Boost Master Chevy wagon that runs in the 7's. The spirit in Georgia was fun, will go again. Mustang Round Up, A+, was another success, a yearly show put on by Jack Miller was an eye opener on how many different Mustangs are available. My favorite was the Barrett Jackson Edition. Weather was great! Event offered approximately 500+ vendors, weather was perfect! Deals were to be had, the big attraction, "Big Daddy" Don Garlits and his hybrid Swamp Rat with the new version 392 Hemi on nitro. Spectator numbers were down, for this reason I grade a C. Trying to find show on internet proved challenging; the American Group holding this event may want to address this fact. (Carlisle, PA) - Carlisle Fairgrounds, located about 125 miles west of Philadelphia, has become one of the iconic locations for the gathering of automotive enthusiasts conducting several specialty mark events each season. The Spring Carlisle Collector Car Swap Meet & Corral this year featured largely cars and parts of the 50’s on up along with a host of muscle cars in the car corral. The number of big-block Chevrolet vehicles was astounding, but the majority seemed overpriced! 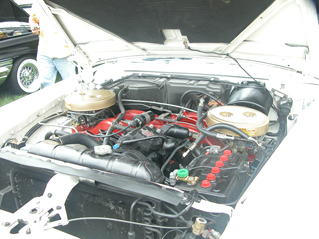 What really caught our eyes was the number of Muncie 4-speed transmissions for sale in the swap meet area of the show. After attending these types of shows throughout the years, this is one part that has always seemed hard to locate. Our main reason heading out to Carlisle was to deliver the restored 1960 Corvette, belonging to Scott Arbaugh, to Al Knoch Interiors, who installed a new convertible top on the car. Al Knoch is considered to be the premier Corvette upholsterer in the country and they definitely lived up to their reputation. While in attendance we also viewed the auction, which featured just over 120 classic cars and several artist renderings of automotive subjects. 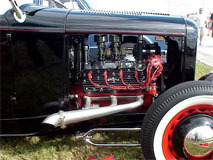 The cars on the block were a mixed assortment from a pristine 1976 Ford Pinto all the way up to a beautiful 1937 Cadillac roadster along with a host of other desirable pieces. The auction was managed by Auctions America by RM, a company that is works closely with the folks at Carlisle Events.